In 2010 Connexys and Textkernel started working together and have constantly broadened their partnership from this point on. 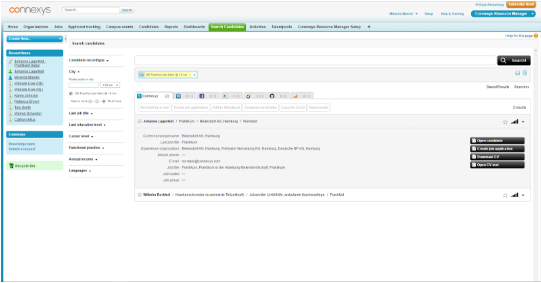 Textkernel’s semantic search and matching technology as well as its CV parsing software Extract! are part of Connexys’ recruitment solution and are used by all their customers. Since 2015 Trenkwalder is one of them. With Connexys’ powerful and complete recruiting solution based on Salesforce.com, Trenkwalder has now connected its recruitment system with the back-end systems of the different countries and integrated it within the company’s website. Smoothless integration of Search! and Match! Last year Trenkwalder already launched a new career website and implemented Textkernel’s Apply-with Widget to offer a positive candidate experience. Further steps in this project were the integration of Search! and Match!. Trenkwalder chose Textkernel’s partner Connexys due to the wish to integrate modern marketing techniques and social media features in sales and recruitment. The Salesforce platform has over 2800 tried-and-tested apps, which can be used in addition to Connexys. Furthermore, they can also integrate features such as Outlook and agenda integration, calendar, e-mailings, newsletters, social media integration, surveys, talent management tools and administration apps. On top of that, Textkernel’s semantic search & match engine is smoothly integrated into Connexys and their Salesforce platform. The technology makes it easy to find the right candidates as well as internal and external job openings from within Connexys’ interface. “Our goal is to develop and implement innovative recruiting methods which enable our users in all 17 countries to work fast, flexible, and effectively in order to find and retain the best candidates for our clients.” explains Michael Pries, Head of Corporate Marketing at Trenkwalder International AG. Connexys’ solution is a user-friendly system with a clear structure. It is mobile, so the user can just as easy access the ATS with a smartphone, tablet or desktop. Tightly integrated into this is Textkernel’s semantic search and matching software which can adapt to any screen, enabling user-friendly searching and matching of jobs and people on any device. Furthermore, the Salesforce App gives Trenkwalder access to their CRM data anywhere, anytime. Not only can candidates apply with their mobile phone, also recruiters can pick up the process on their mobile devices. One of the reasons to integrate Textkernel’s search and match technology, was the easy integration into mobile devices. “We appreciate Textkernel as a partner not only because they are the leading provider for Search, Match and CV extraction technology. They also are always willing to listen to their clients and really act as a partner.” explains Gijs van Heijst, CEO Connexys, his decision for partnering with Textkernel. HR service provider Trenkwalder International AG is one of the market leaders in central and eastern Europe with over 30 years’ experience. The company has been a part of the Droege International Group AG in Düsseldorf since 2011. Trenkwalder is the market leader in Austria, Hungary and Slovakia and has a turnover of roughly 850 million euros. The organisation currently brings more than 55,000 employees together with 10,000 clients from over 250 locations in 17 different countries. Connexys is the Dutch market leader in technological solutions for finding, matching, selecting and retaining talent. The right person in the right position. Since 2001, Connexys has been specialist in successfully addressing challenges in the field of resource management: recruitment, hiring and labour mobility. Filling a vacancy or finding someone for a task or project? Connexys allows purchasing, recruitment and HR to work together efficiently. Textkernel is the international leader in semantic recruitment technology offering high quality multilingual CV parsing and semantic search, sourcing, lead generation, matching tools and labour market statistics to accelerate and improve the process of matching demand and supply in the job market. Textkernel’s technology helps companies improve the candidate experience and find the best talent, allowing them to fill jobs faster.